The Hobart 500553 Handler 210 MVP For Use with SpoolRunner 100 can handle all the needs of a simple, handy homeowner and still handle the big capacity of a professional welder. A handy homeowner might just need to handle a few maintenance and construction works at home. This machine provides the user with enough power to handle any different welding needs they might have to accomplish. Portability can be the most crucial question on the minds of most welders. Yes, this machine is lightweight, making it easy to move around. You can bring your welder to work from a different location within a short time. Below you can learn more why this machine is getting all the attention. It operates on a 230-volt or 150-volt power outlet without using any extra tools. Its welding capacity is rated from a 24 gauge up to 3/8-inch steel. The machine has a 7 voltage settings at 230-volt or 4 voltage settings at 150-volt for fine tuning to have precision welding. Presence of a cast aluminum drive system. The machine design and assembly is done in Troy, Ohio USA. The Hobart 500553 handler has a dual groove for a quick change for the drive roll. You can change from 0.030–0.035in. (0.8–0.9mm) super easy. The regulator and gas hose provided by the manufacturer. The manufacturer provides a limited 5/3/1 warranty on the device parts. The machine has infinite wire feed speed control. In the welding field, you can expect to work with different types of material (steel, stainless steel, aluminium) with varying thicknesses. The Hobart 500553 handler can be used when working on the different materials with the use of the infinite wire feed technology. The machine still offers 7 different settings for varying the voltage. You can always select the most reliable setting based on what you need to weld. Measurement of this welder is 24×18.6×13.2 inches (L×W×H), really compact, combine with its weight’s 87,6 pounds make it easy to carry to any cramped place or your house’s roof. Aluminum welding is always a challenge not only for beginner welders but also for professionals. By using Hobart 300796 SpoolRunner 100 Spool Gun which can be bought separately, you can remove the MIG gun and plug the Spool gun in, you can weld aluminum with no problem. This mig welder can deliver 130 amps of welding output at a 30 percent duty cycle. It is good enough to use for most of home welding application and light industrial projects. You can find this guide on the back of the access door of the machine. You only need to pick the material you are welding and the thickness, then the instruction will give you the voltage and the wire feed setting. All you have to do is focusing on the welding and forget the guesswork. The manufacturer has already assembled the machine for you. From the moment, you take it out, setting it up should take only a few minutes then you are ready to weld. The manufacturer includes a comprehensive manual on how to set up the machine and get ready to work. With this machine, you can easily handle all the DIY projects. The machine is commonly used to weld the auto body panels, trailer frames, tool carts, lawn and garden equipment, metal sculpture and many others. The examples just show how the machine can be adapted to different uses. 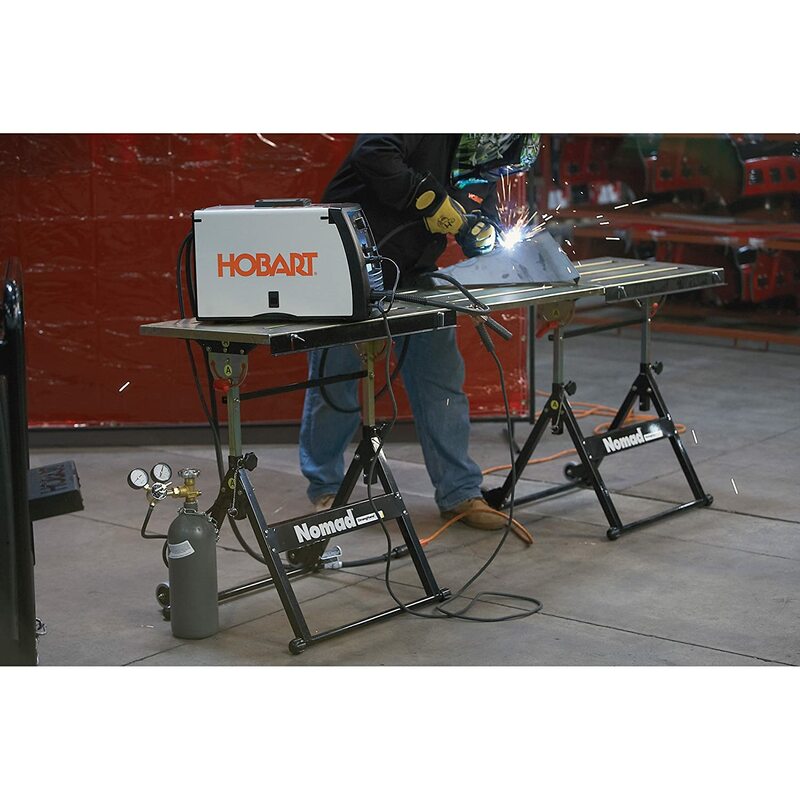 The Hobart 500553 Handler can be handled easily even by anyone who is a beginner in welding. Most people who are still training in the welding field are advised to use this machine so as to perfect their skills easily. The machine presents a high output duty cycle than most of the other devices in the industry. The machine is built to offer more power and better performance needed for having high-quality welds. The manufacturer provides a good warranty on the parts to prove the point that it can last for a long time. Safety is always important for anyone using a welding machine. This one offers a thermal overload system that will protect the machine and the user from those tough applications. There is still a short circuit protection that will guard the machine against the current overloads. Another safety feature to note is the use of a Self-resetting motor protection system. The system protects against the cases of wire overload. Nothing makes a person confident about a machine other than seeing that it is made in the U.S.A. Having such a feature means that the machine has been tested and meets most, if not all the industry requirements. The Hobart Company offers a 5/3/1 industry leading warranty on its machine. This means that you get 5 years warranty on the transformer, 3 on the electronics and 1 year on the guns. The machine offers more features than most welding machines in its category. It is no surprise at all to find it as the best seller on top online stores like Amazon. This is proof enough that the machine can deliver on what many features that welders need. Regularly clean the machine after use at the end of the day. Secure the cords well after you are done welding. This avoids the cords from snapping easily. Replace the broken parts as soon as possible to keep the machine working properly. Take the machine for regular inspections to avoid cases of using a machine that can break down anytime. Use the manual to find other maintenance tips as recommended by the manufacturer. 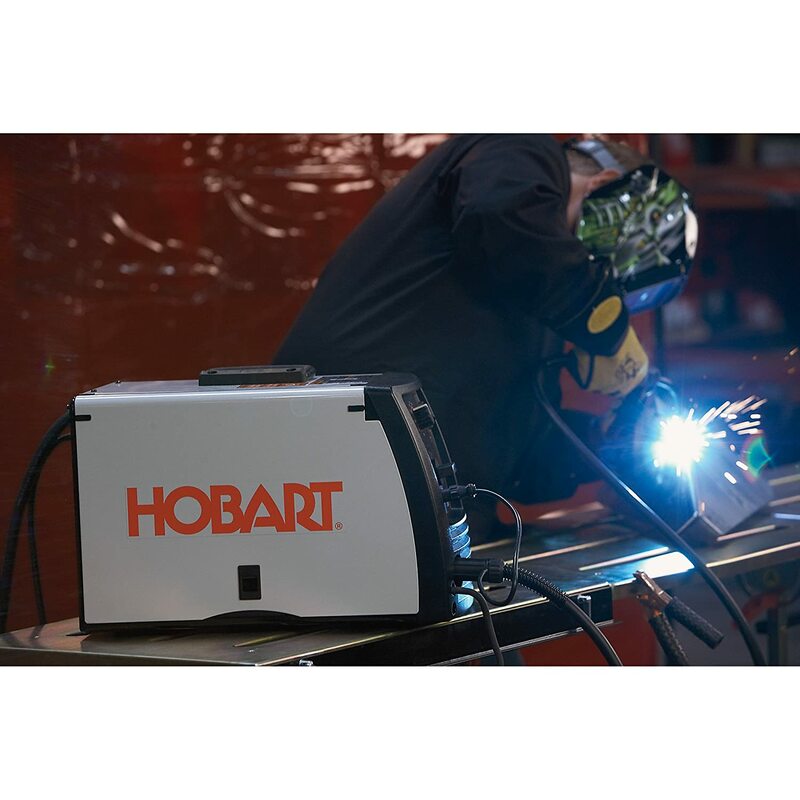 Judging from the reviews about the Hobart Handler 210 MVP Mig Welder, it is easy to say that the machine feels like an upgrade for many people. The skill level needed to operate the welder is low, meaning that even the amateurs can easily handle the welder. The pros still have to benefit since the machine provides many features they can use too. Setting up the machine is simple and fast as the manufacturer provides the user with a detailed manual. You cannot miss a component easily when setting up the machine. It would be easy to say that the machine is affordable and highly recommended because of the features it has to offer.